Thank you for your interest in becoming an All-Outdoors California rafting guide. We hope the following information will help you understand more about our company, what we are looking for in a prospective staff member and how to take the next step in applying for employment. If you are seeking employment as a whitewater rafting guide but you have not yet attended a guide school, then you should visit our Professional Guide School page. 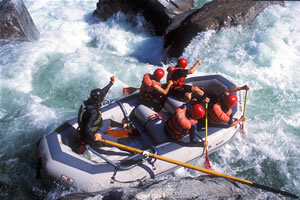 All-Outdoors California Whitewater Rafting is a family-owned and operated company. The Armstrongs have been rafting and conducting river trips for over 50 years. We have grown to have operating permits on most of California’s whitewater rivers and have become one of the largest outfitters in the state. Although we are a large company, we strive to maintain an atmosphere of care and concern for our guides and guests. We want our guides to enjoy their work. We want to provide professional, well-run trips for our clients, while maintaining the family atmosphere that marked the beginning of All-Outdoors. 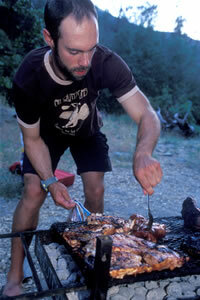 All-Outdoors hires guides from a wide variety of backgrounds. Our staff of 100 guides is composed of approximately 40 full-time and 60 part-time. During the off-season, our full-time guides hold various occupations, such as college professors and students, schoolteachers, and outdoor specialists. Most of our seasonal part-time guides were once full-time guides who have moved on to other careers but now guide on weekends. Their occupations range from careers in law, dentistry, business, computer programming, medicine, education, fire fighting, engineering, building trades and law enforcement. The diverse professional backgrounds of our guides allow them to interact well with our clients who are from similar disciplines. Having this connection with our guests enables All-Outdoors to respond quickly to the changing needs of our clientele and produces a higher standard of service for them. For more about our guides read Guide Bios on the AO Blog. In California, due to the various different types of rivers, rafting is a popular summertime activity for a wide variety of people. It is popular for the athletic and adventuresome, a perfect outing for team building groups, an educational opportunity for school groups and a popular option for family outings, bachelor parties, etc. Therefore our season is the busiest on weekends when professionals take their weekend getaways, and during the months of July and August when families plan their summer vacations. While we often have trips as early as mid-April, the season usually picks up speed the last weekend of May and won't slow down until after Labor Day Weekend. Most full-time guides will work from late May through the first weekend of September (Labor Day Weekend), and clock the majority of their guide days in July and August. Some guides will arrive earlier, for the spring excitement, and/or stay longer in the fall, helping execute the final trips and participate in the post-season strike. As a result of our company’s efforts, All-Outdoors has acquired permits on ten of California’s best rivers from southern California to southern Oregon and therefore, we are able to provide the public with a unique opportunity to enjoy their natural resources that would otherwise not be available. Ultimately, it is our group of skillful guides that safely and professionally execute our river trips. For this reason, we demand a high degree of integrity and a solid commitment to professionalism. As a result of the popularity of whitewater rafting, we receive a large number of inquiries from people interested in becoming an All-Outdoors river guide. Many are experienced guides who have worked on rivers all over the country and are looking to spend a season on California Rivers. Due to this competitive applicant pool, we feel it is vital to meet our candidates “in person.” Since we are unable to come to you, we would like to give you an opportunity to visit us, meet our staff, and familiarize yourself with the rivers and our operations. We encourage all qualified applicants to come spend a day with us and experience our program. However, prior to arranging a date for a visit, we ask that you complete and mail the All-Outdoors Guide Employment Application. Please make sure to include a resume and copies of your valid certifications so that we may be better prepared for your arrival. We appreciate your interest in our company and look forward to your involvement in All-Outdoors.